I saved one of my best casino news stories of the week until Friday. Hopefully this story about an elderly slots player's big win will bring you luck over the weekend! 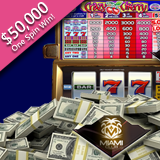 A lucky Miami Club Casino player is still in shock after winning $50,000 on a single spin of the 3-reel Crazy Cherry slot game. Stephen G., 75, was placing max bets, as he usually does, when suddenly three Crazy Cherry symbols appeared across the center pay-line. That paid 5000X his bet and immediately put $50,000 in his account! Nice one, Stephen! Stephen said he's been playing at Miami Club for almost two years now. He mostly plays three-reel slots. Crazy Cherry and Triple 10X are his favorites. He’s won a little here and there but this is his first big jackpot win. Stephen G. was glad he'd placed a max bet when three Crazy Cherry symbols appeared on one line. Crazy Cherry is a basic, three-reel slot game with traditional slots symbols: sevens and bars. Crazy Cherry is available in Miami Club’s online casinos for desktop and laptop computers (download or instant play) and is also in the mobile casino for smartphones and tablets. Miami Club offers a wide selection of unique games from Wager Gaming (WGS) and is known for its frequent one-day, seven-day and month-long slots tournaments.